Canada, Edmonton- Celebrations for Canada’s 151st birthday were buzzing all over Edmonton on Sunday, and 110 residents started their day by becoming the country’s newest citizens. Two citizenship ceremonies were held in the morning to kick off the day of activities. At the Alberta legislature, a packed crowd of Canadians wearing red and white and a stage full of dignitaries welcomed 60 new citizens from 20 different countries. It was an emotional morning for Mirene Sanchez as she walked across the stage to pick up her certificate with 11-month-old daughter Celina Hawryluk, who is already a Canadian. Originally from Ecuador, Sanchez came to Canada for a visit 10 years ago. She instantly felt a connection to the country’s kindness and diversity, and knew she wanted to call Edmonton home. As well as meeting her husband, Sanchez said she fell in love with hot yoga after arriving and has been an instructor at Be Hot Yoga Edmonton for five years. It was also a long journey for the von Elling’s, a family of seven who came from South Africa 10 years ago. The family initially moved to Canada after leaving their home in Durban due to political turbulence. “I think not everyone realizes what a privilege it is to be a part of this society until you come from somewhere else that’s just not as stable. It’s so comforting to know there’s so much acceptance here and there’s so much opportunity,” von Elling said. 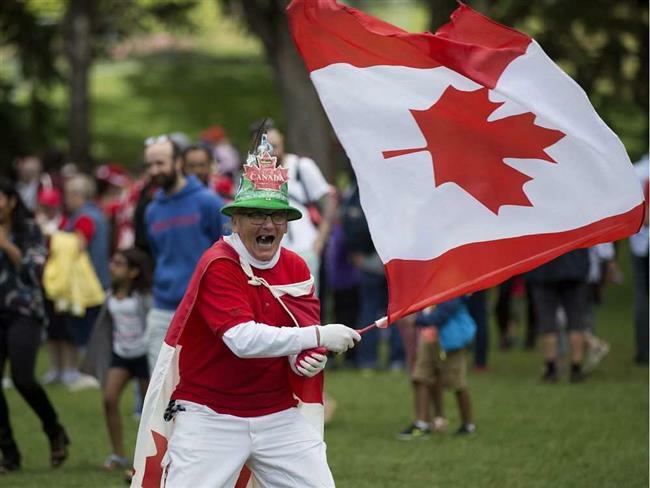 Shortly after the citizenship ceremony, Canada Day enthusiast Henry Stephens stood by the cake line with his large flag to increase excitement. “I celebrate my heritage and every year I come and hope I can instil it in these young guys,” Stephens said, draped in red and white. Stephens said he started emphasizing the importance of Canada’s birthday in 2000 because he wants younger generations to remember the efforts of citizens who came before them. Later in the afternoon, the Ahmadiyya Muslim community held a Canada Day celebration to launch a partnership with the Edmonton Food Bank. Building on a community race series across Canada, the group announced the inaugural Run for Edmonton will be held Sept. 23 to raise funds for the charity. The event will take place in Sir Wilfrid Laurier Park and feature both a five-kilometre and one-kilometre fun run/walk. “There is still a big gap in addressing food need in the city and we’re trying to do our part to address that gap,” race director Qaasim Mian said. Politicians from various levels of government and political parties were in attendance, which federal Infrastructure Minister Amarjeet Sohi said was essential to show the bond all Canadians have when it comes to celebrating diversity. “We are are all Canadians coming together to celebrate and be part of an experience that is best in the world,” he said to the crowd in attendance. The day of festivities wraps up at 11 p.m. with fireworks lighting up the river valley.